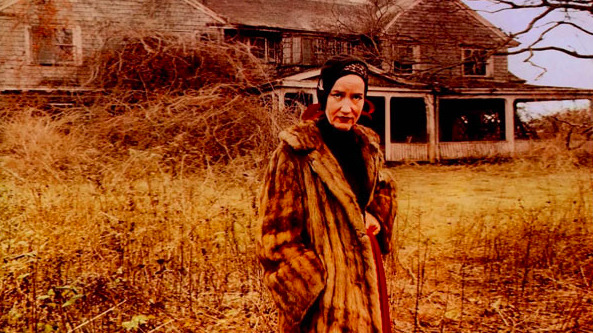 It started as a counter-culture movement in the 1970s and 80s, pioneered by those that appreciated living off-grid and on the land. Changing directions and emphasis several times over the last forty years, today’s small home movement is characterized by simplified living in small spaces (check outlast week’s GMA segment). While it’s not for everyone, it’s attracted attention and gained support for various reasons--environmental, economic, spiritual--and can be seen in communities across the globe. There’s at least one documentary (“We the Tiny House People”) on the subject, and this year, even a television program (“Tiny House Nation”)! The typical American house is, on average, about 2,600 sq ft. Downsizing a primary residence makes a lot of sense to anyone who feels “footprint guilt”, a financial squeeze, or simply wants more time to enjoy their space rather than always cleaning or fixing it. Let’s face it, it takes a long time to dust and mop a home that size--and all the stuff that’s in it (right, Little Edie?). 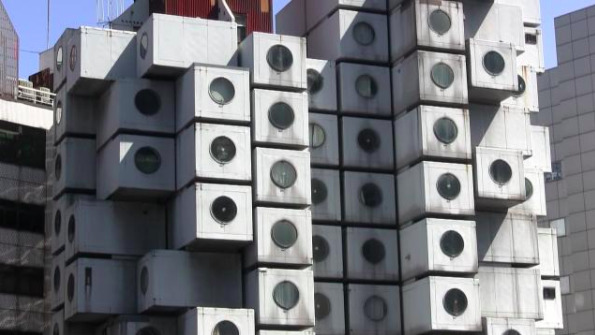 In parts of Europe and Asia, population density has necessitated the creative use of vertical space to build tiny residences, such as in this Capsule Tower. Nakagin Capsule Tower: Mixed-use residential and office tower designed by architect Kisho Kurokawa and located in Shimbashi, Tokyo, Japan via WikiCommons. 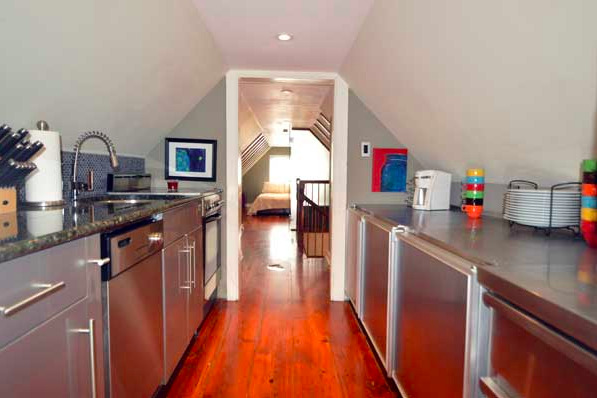 Whatever the impetus, those that chose to live in small spaces pay attention to every nook, cranny, and detail. In small spaces, design is inherently valued over size. This is where dual-purpose features, multi-functional/kinetic furniture, and space saving equipment and appliances come on the scene. There are designers and decorators who concentrate in outfitting small spaces, as well as specialty brands that sell customized furnishings, cabinetry, and appliances. For the DYIers, though, appointing a small space is becoming increasingly easier as the more common retailers are getting into the game as well. Limited space for residential growth isn’t confined to places like Tokyo. Our tiny little slice of Heaven right here in the Lowcountry is bounded by water on three sides and underneath, and by the BAR (thankfully) going up. We’ve been coming across a fair number of delightful small spaces of late, and have been pretty impressed with how y’all are getting creative and making these work. In particular, there’s this little old house on this tiny little street over in Harleston Village that has a couple of great examples that we love...have a look! 11 West Street (ca. 1826) is divided into four great small-space units (A-D). West Street was originally part of the Mazyck Lands--a 34 acre track just outside of Charles Town purchased by Isaac Mazyck in 1712. His heirs divided and sold off the lots, two of which were bought in 1821 by Dr. William Lennox Kirkland. Dr. Kirkland built several buildings near the corner of West and Mazyck (now Logan) in the mid-1820s, including the one now known as 11 West Street. 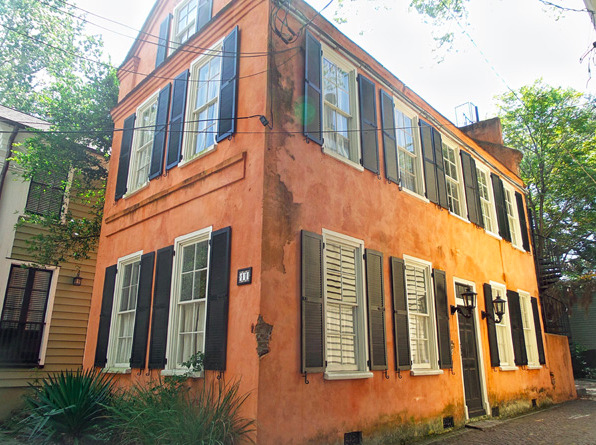 This two and a half storied home was constructed with Charleston ‘grey’ brick and oyster shell stucco, and escaped the disastrous fire started on Clifford Street in 1864 that destroyed the German Friendly Society Hall on Archdale Street as well as numerous other buildings. General Rudolph Stegling enlarged the dwelling with a third story rear addition in 1868, and two years later the residence was purchased by Henry Semkins, in whose family it remained until 1979. The house is one of the only original buildings still standing on West Street. 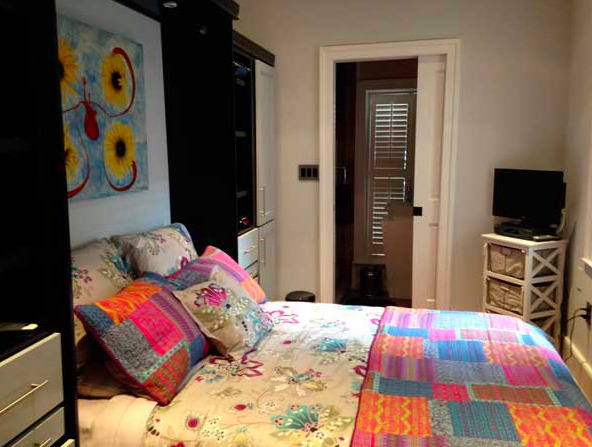 Unit B, is the perfect small space to utilize a Murphy bed, a bed that closes up into the wall when not in use. This property is managed by Ginger Scully. Unit D. Lois Lane represented the buyers this week in the purchase of this third-floor unit. The kitchen represents an ingenious use of small-space appliances and cabinetry. Not one inch of space is wasted here. Ginger Scully will be managing this property as well, which will be made available fully (and fabulously!) furnished. Ask her to show you the roof-top deck!